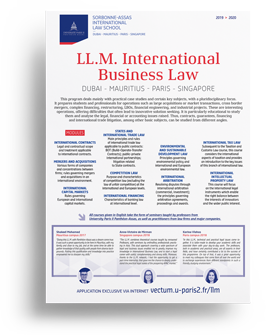 In Mauritius, the LL.M. (Legum Magister) in International Business Law is a part-time program that can be completed within 9 months. The LL.M. will give you an in-depth understanding of some of he most important and rapidly-changing fields of Law and a nuanced understanding of European legal systel and culture. All of that in a serious, friendly and energetic atmosphere! The LL.M. in International Business Law will secure its graduate access to major European or African professional training schools, in particular Bar Schools, for students with a previous education in Law. It will also prepare students to enter legal departments of international companies, including students without previous experience in Law. The program is scheduled to allow professionals to attend easily all courses. It will concentrate on case studies and deepen key legal subjects from a transversal and pluridisciplinary perspective. For more information, you can send a request to our Recruitment Team.